Try typing the word 'diet' or 'losing weight' in Google and the amount of advice saying STAY AWAY FROM CARBS will swamp you in no time. But guess what, the good news from us is not all carbs are bad. In fact, they are as essential as protein or fats as part of a healthy diet. We are firm believers that by making the right choices, you will get all the nutrients you need and still be able to cook all your favourite dishes, and never fell the need to be that 'Sorry, I'm on diet!' person at a dinner party! Today We have chosen a rye bread without yeast. Rye is an all-time favourite for us as it is extremely high in fibre, which plays an important role for satiety, regularity and is also great for illnesses like diabetes. It is also particularly high in manganese, phosphorus, copper, pantothenic acid and magnesium which means it replenishes your body post working out or if you are on a low-calorie diet. If you don't want to bake your own rye bread, don't worry, it is available in supermarket, bakeries or little pop-up shops - so there is no excuse to not get these healthy carbs into your diet! Tip: If you like it a little cheesier, spread a thin layer of low-fat cream cheese on the rye bread before topping it up. Start boiling an egg for about 10 minutes. While the egg is boiling, start peeling a carrot and grate it. Cut some nice thick slices from a gherkin and tomato. You can use all of the veggies and mix a crunchy side salad. 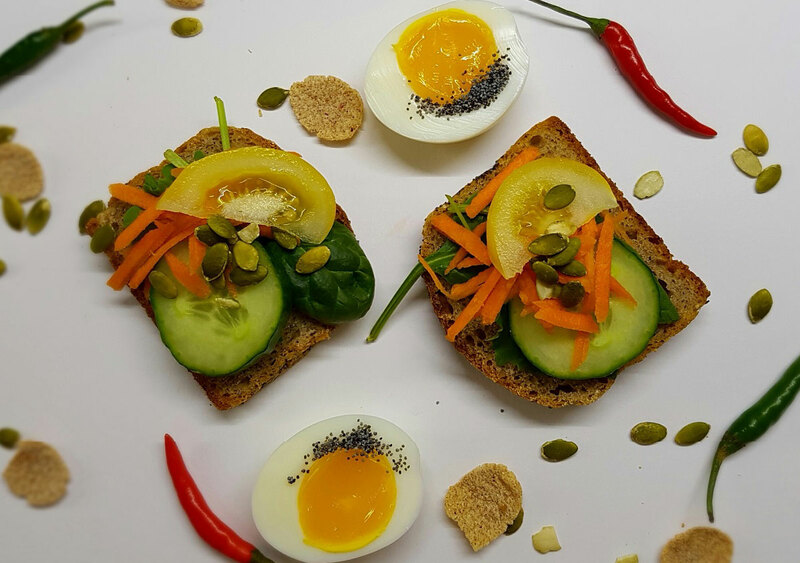 Cut two slices of rye bread from your loaf and top it with spinach leaves, tomato, gherkin, carrot and pumkin seeds. Rinse the hot egg under cold water and start peeling it. Cut it in half and sprinkle some poppy seed on it. If you like your dishes a little hotter, add some fresh chilli for extra spice.